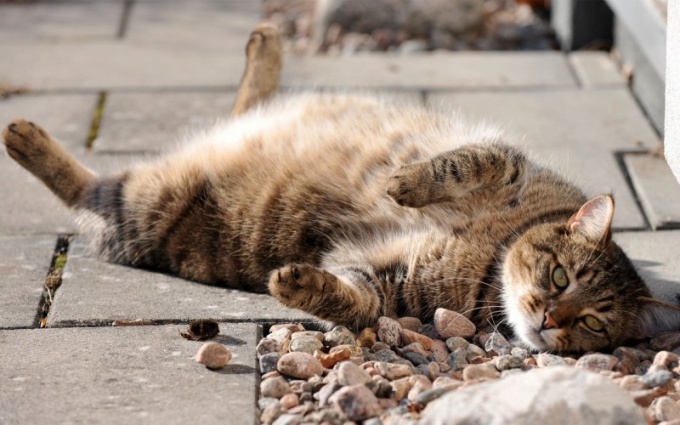 Diabetes mellitus is a fairly common disease of older domestic cats requiring owners of special care and attention to the selection of eating regimen and composition of the feed Pets. Before you can define a diet for sick cats, it is necessary to consult a veterinarian who will specify the type of detected diabetes and give advice on food choices. If the cat throughout life ate natural foods, and not specialized feed, it is best to perform and minimize the number of incoming eating carbohydrates (they should be no more than 5%). In particular, this means that food should not be exposed to grain products, rice and corn cereal, soy additives. Natural food for animals with diabetes should be as close as possible to the diet of wild cats: from 50% of all incoming foods should be proteins (raw beef, pork, chicken, offal), 20 - 25% fats (dairy products, especially cottage cheese and sour cream) and carbohydrates of plant origin (raw vegetables and fruit). To feed cats with diabetes is small portions 2-3 times a day for insulin-dependent diabetes combining feeding time with time of injection of insulin. When feeding your pet dry food is carefully studied the proposed range. Feed containing beer boiled rice, cornmeal or corn porridge, barley and soy proteins, it is excluded from the diet. The composition of a good dry food suitable for cats with diabetes must be exclusively flour from meat (pork, chicken, beef, fish), ground pulp (as valuable for diabetics source of fiber), natural flavors and fats. If the cat is psychologically able to switch to canned food, it is better to feed her canned food. Canned food used for feeding cats with diabetes, the composition is similar to dry. They must be animal protein, fat, fibre. You should not feed cat food, in which the percentage of carbohydrates is more than 10. The mode of feeding canned food also involves food in small portions 2-3 times a day, not more. Cats with diabetes of any type is strictly forbidden to feed delicious, but very harmful chips, sausages and other foods that animals love to beg from the owners. This can lead to the exacerbation of the disease, improper nutrition increases the weight of the animal. Diabetes need to keep a pet's weight under strict control: do not give to overeat full of cats, on the contrary, supplementation to normal weight (normal for the breed, size and age of the cat) thin. More precise information for each specific animal is obliged to give the attending veterinarian. There are breeds of cats are prone to diabetes, for example, Siamese and Persian cats. Control the weight of your pet, since diabetes often occurs because of increasing body mass.